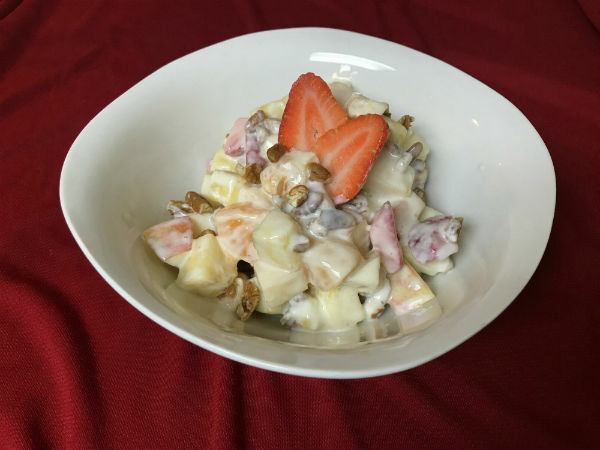 Named after the food of the Greek gods, ambrosia salad is light, fluffy, a little crunchy and, of course, very sweet. I don’t know about you, but ambrosia salad was always a staple dessert for the holidays in my family, and my absolute favorite thing to eat on Christmas Eve. 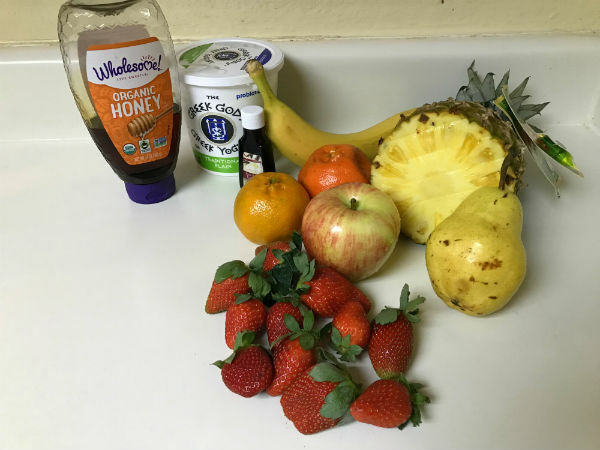 So with Christmas just around the corner and holiday parties taking place daily, I thought I’d share my healthy, upgraded version of the usually not-so-healthy delight so that anyone can try it and wow friends and family with a dessert that is healthy and just as sweet and delicious as the original. The traditional recipe is made with pineapple, tangerine, maraschino cherries, shaved coconut, mini marshmallows, whipped cream, and pecans. However, there really is no rule as to what other ingredients can be added. 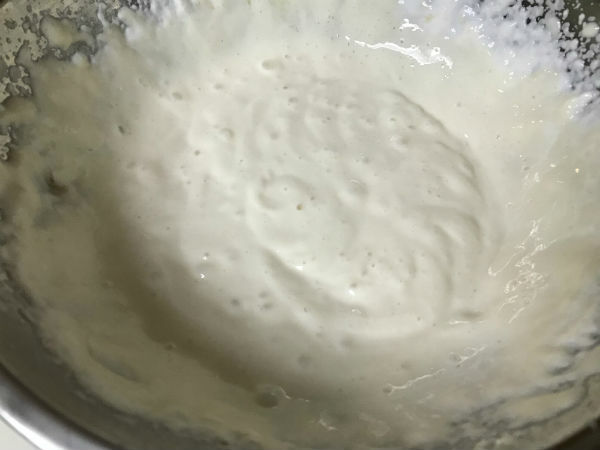 Some people include strawberries, grapes, and bananas; and some people use sour cream, yogurt, and even mayonnaise instead of whipped cream! It’s all about the flavor you’re looking for. My mom’s recipe is a bit of a hack, as she would simply buy canned fruit -which already had all the fruits chopped and ready to go- making this the easiest dish to prepare since it only takes a couple of minutes to chop the nuts, dump the canned fruit, whipped cream, marshmallows, and pecans in a bowl and stir it all together. Of course, as you may imagine, fruits from a can have a lot of extra sugar from the syrup they come in, and store-bought whipped cream tends to have way more stuff than just heavy cream and sugar in it (which is all that should be in there), including hydrogenated oils, high fructose corn syrup, and a dozen additives that really have no business in whipped cream -or anything else, really. And don’t get me started on the marshmallows… The first ingredient in most is HFCS! And have you ever seen how maraschino cherries are made? They literally bleach them and then dye them with Red 40. No thanks. None of those. I don’t add coconut because I am not a fan of shredded coconut, but you definitely can! You can also substitute the traditional pecans for your favorite nut; walnuts and almonds go especially well with it. On to the recipe then! Separate tangerine slices and remove the fibers and seeds. 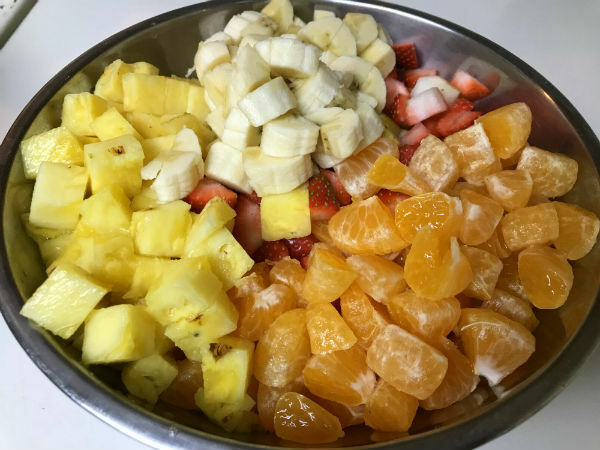 You can make this recipe even cleaner by choosing all organic fruits and nuts, and as I mentioned earlier, there’s no rule against adding different fruits. Depending on where you live and what’s available, you could add anything from pomegranate, mango, peach, fresh cherries, or whatever your heart desires! If you avoid all added sugars (yes, even organic honey has it’s bad side, it is technically processed by bees when they make it), you can always substitute honey with stevia! Go ahead and give it a try this holiday season, or any other time and let me know how it turned out! And if you come up with different fruit combinations, please share that with us as well!